The first one I did was plastic and I chose to use the Rustoleum high heat spray paint, in white, that I used on the guest bedroom lights. I taped off the stem and sprayed 2 coats. After the paint was dry I used some gold Rub ‘n Buff on the stem. The high heat spray paint has a matte finish, similar to a real pumpkin, and I really liked it. On another plastic pumpkin, I used the same spray paint and Rub ‘n Buff but I also rubbed some dark walnut stain on it after the paint was dry. I like this one the most because the stain gives the pumpkin some dimension. The next pumpkin was painted with chalk paint in an off white. This pumpkin was some kind of plasticky styrofoam so the orange color mixed in with the paint on the first coat. I ended up doing 3 coats on this pumpkin and using some dark walnut stain to touch up the stem a bit. I tried some regular latex paint on my next pumpkin. Like the one before, the orange ran into the white on the first coat. I also did 3 coats and stain on the stem. The last pumpkin I used twine, left over from my stool makeover, and hot glue, kinda like the genius twine pear from Sondra Lyn at Sondra Lyn at Home. I simply started at the bottom of the pumpkin with a little glue and wrapped the twine around, glueing along the way. It ended up looking like an apple because you lose the ridges that are traditionally a part of a pumpkin, but I still liked it. I guess if I had to choose, I would say that I like the spray painted one with stain followed by the twine wrapped one and the white spray painted one. 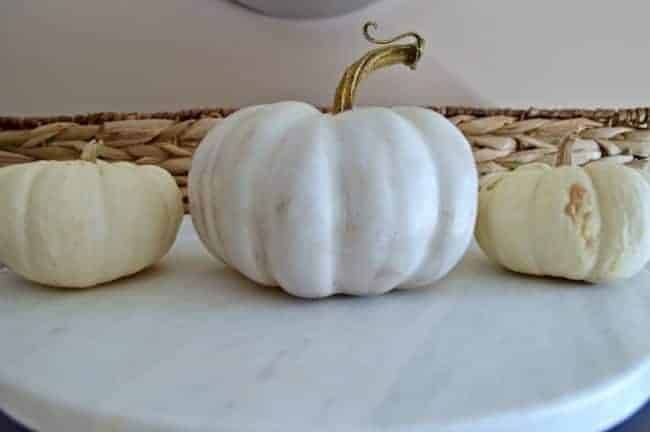 I’m not crazy about the look of the hand painted pumpkins, and the fact that they took 3 coats. Using spray paint was definitely quicker and easier. Would you give a pumpkin a makeover or do you think they look beautiful just the way they are? 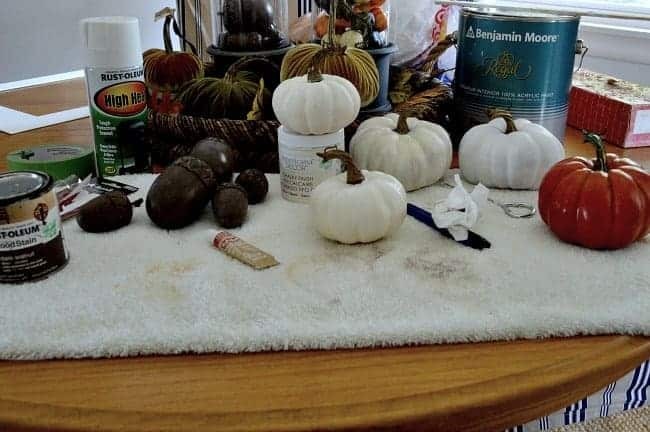 I’ve got a pumpkin patch on my craft table right this moment. I just finished Orange polka dots on a black pumpkin, two are a light aqua and the others I’m doing in off white. It sounds like you’ve been busy Carol and having a lot of fun. There’s nothing better than spending some time crafting pumpkins, there’s so much you can do. 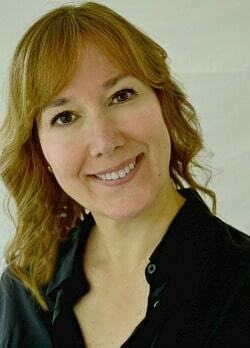 Thanks Sondra! Your twine pears are worthy of a shout-out. ;) Great idea and so awesome! Appreciate you stopping in today. I like your ideas and examples — teaching me a thing or two along the way =Thanks.. 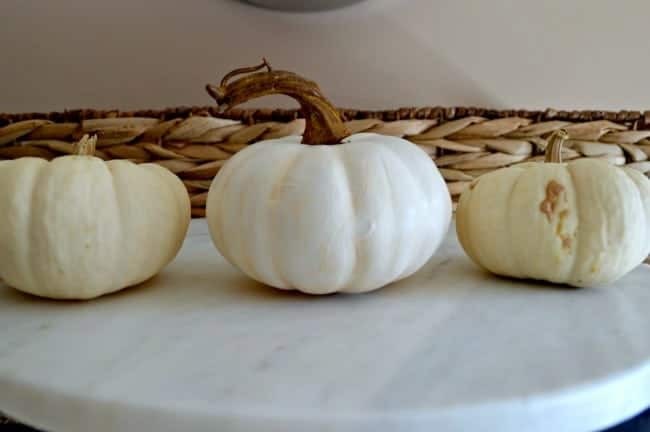 I like the twine pumpkin best – I wondering if you took the twine and went up/down giving it a hilling look instead of around and around.. just brainstorming.. will it work? Thanks Kristeen. Glad you found my post useful. I think you have a great idea with wrapping the twine up and down. I’ll be sure to try it out. Doing the one pumpkin took a lot longer to do than I thought it would so I ended up stopping after 1. I do hope you will share your mini pumpkins with my Big Autumn Bash Link Party! Thanks Mila. It was a fun little project to do. Thanks so much April. I appreciate the invite and will head right over. So pretty! I love how you mixed them all together…it adds so much interest and the orange really pops against the other colors and textures! Fun! Thank you for leaving such a nice comment Kim. Much appreciated! 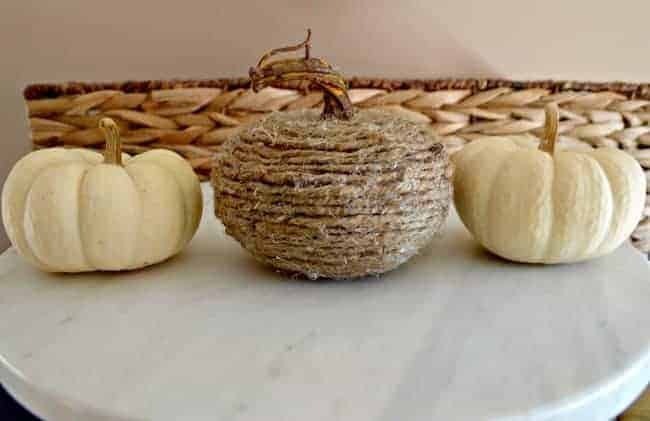 Your twine wrapped pumpkin is just the sweetest thing! Thanks Susan and Bentley! 🙂 So glad you stopped by. Just here to say Hi from Between Naps on The Porch. Love your pumpkins, had some real on my front stoop last year. I’d find them on the ground, guessing the squirrels munched on them at night. I may have to run to the $ store too. Thanks for sharing a cute idea. I have had some squirrel visitors too. I’ve used vaseline on the big pumpkins and they seem to leave them alone but the’ve taken my little ones. 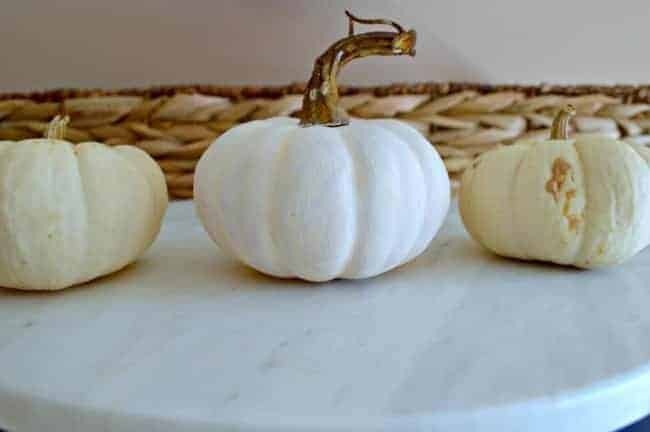 Fake pumpkins are what I mostly use now, and you can do so much with them. 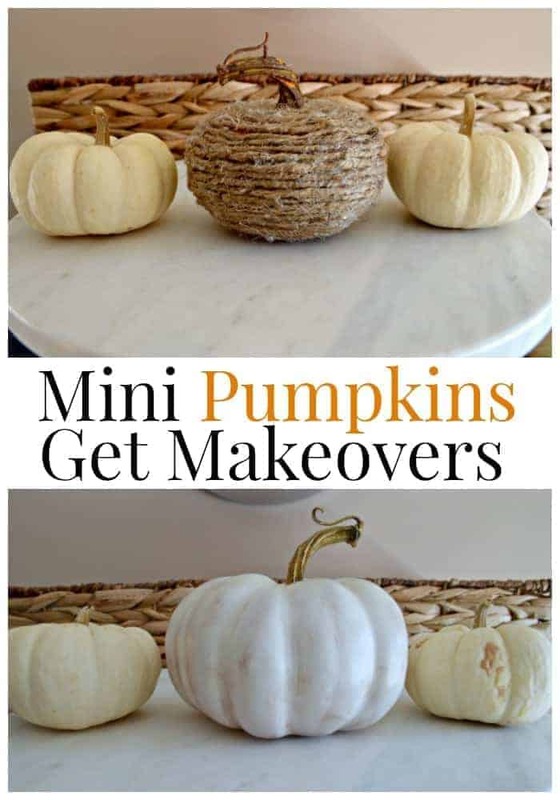 Gotta get me some faux mini pumpkins! Love the tutorial Kristi! 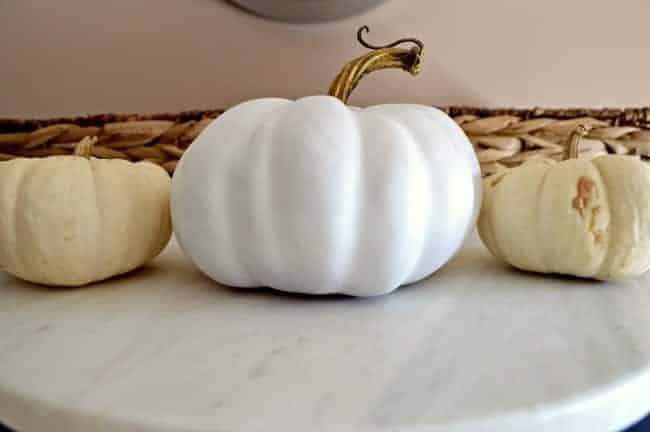 I was at the dollar store the other day looking at the foam/plastic (whatever the heck they’re made of) mini pumpkins and gourds because I was thinking of painting them too. However, the husband was with me and well….you know how it goes….you’re browsing, he’s already trying to leave the store. Needless to say, I left with the shelf paper I came in for and no pumpkins. Guess I’ll walk over another day since we have two different dollar stores just a couple blocks away. 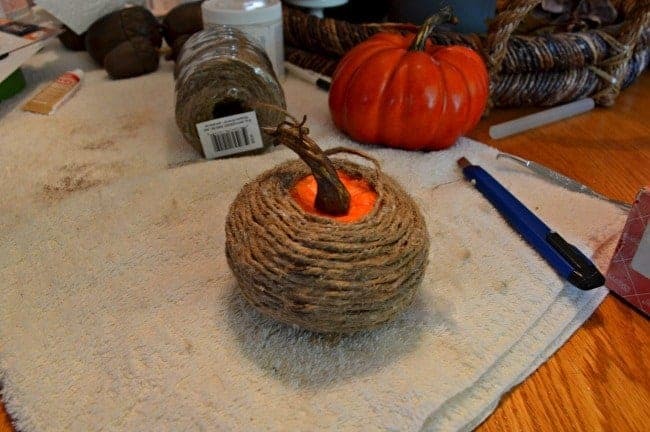 I think your twine wrapped pumpkin turned out really cute! I saw some awesome brightly painted gourds on the blog Inspired by Charm. I’m saving that idea for next year. 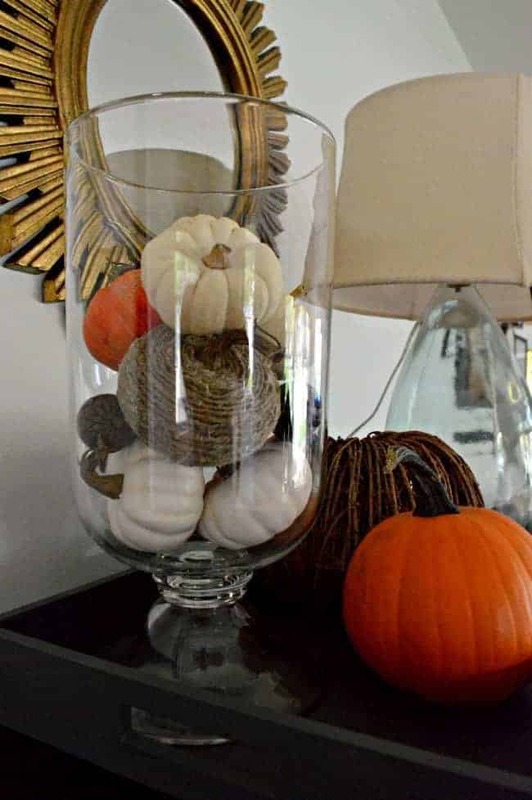 You have said that you love color so painting pumpkins with bright a bright color sounds like a great idea. I liked my twine pumpkin best but I thought it looked like an apple when I was done. All that work and it didn’t look like a pumpkin anymore. 😉 Oh well, apples are Fallish too right? Oh I just love how they look in the glass !!! I paint pumpkins lol – but I’m adoring that twine wrapped up – it’s fabulous !